ETH experts in earth sciences and engineering geology have tested out a new method on the Rhone glacier that will allow detailed examination of the interior of the glacier and its movement. The effectiveness of this new technique was better than expected. Sometimes scientists simply need to try out something that no one has ever attempted before. ETH Professor Andreas Fichtner from the Institute for Geophysics decided to take a shot in the dark. 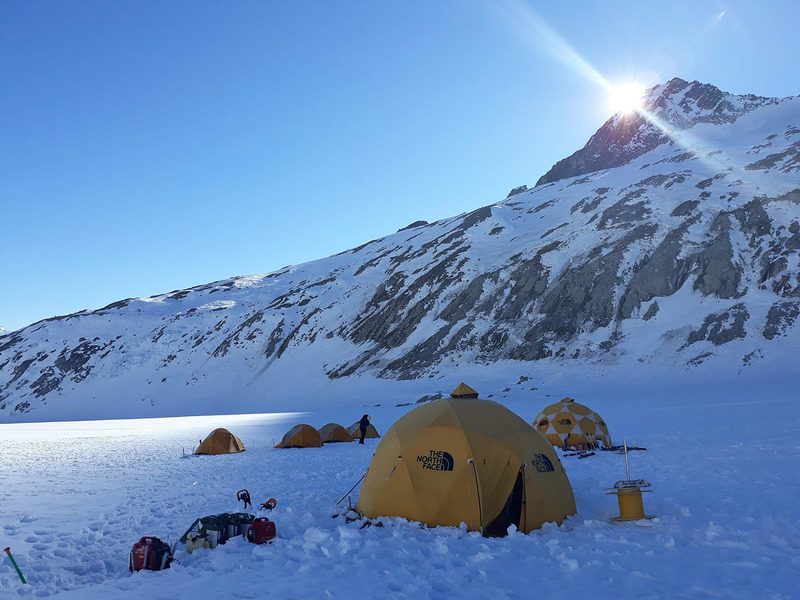 Last week he and his colleague Fabian Walther from ETH Zurich’s Laboratory of Hydraulics, Hydrology and Glaciology, along with their doctoral students, conducted their first field tests on the Rhone glacier using a fibre-optic cable. Their goal is to be able in future to examine glaciers and draw conclusions about their internal composition, volume and movements. Fibre-optic cables can be used to measure vibrations by directing short laser pulses into the cable. Minute impurities along the cable disperse the laser beam in a specific manner. If there is no change in the cable, the dispersion signal remains the same. If it expands in response to seismic activity, the dispersion signal is modified. The cable used by the researchers is one kilometre long and has regular measurement points every metre. In this way, the scientists hope to replace hundreds of expensive seismometers and be able to capture more measurement data with far less effort and infrastructure. Fibre-optic cables have been used for measuring vibrations for some time, for example in the monitoring and safeguarding of critical infrastructures, such as nuclear power stations. Other researchers recently showed that fibre-optic cables can also be used in place of seismometers to measure seismic activity. “But no one has tested this technology on a glacier, even though it is a particularly suitable and – given climate change concerns – interesting object of study,” Fichtner stressed. "The experiment went well, and to our positive surprise, the fiber optic cable registers glacier earthquakes much better than we had hoped," Fichtner says happily. "Nobody has yet tested this technology on a glacier, even though it is a particularly suitable and interesting study object with regard to climate change." To perform their experiment, the scientists laid the fibre-optic cable across the surface of the Rhone glacier. Warmed by the sunshine, the cable melted in the snow and sank down into it. “That’s an important aspect, as the cable needs to be firmly embedded under the surface,” says the ETH professor who could only follow the experiment from a remote location. For control purposes, the researchers carried out explosions to trigger measurable seismic waves. Fichtner believes in the enormous potential of the new method. Since these measurement systems require far less hardware, they can be used in remote areas where setting up seismic monitoring stations would be too expensive, such as glaciers in the Himalayas, he says. In the coming weeks and months, the scientists will analyse their data – only then will they find out whether it’s worth pursuing this approach, or whether the test really was a shot in the dark. In order to test their new method, the researchers lived in a base camp on the glacier for several days. 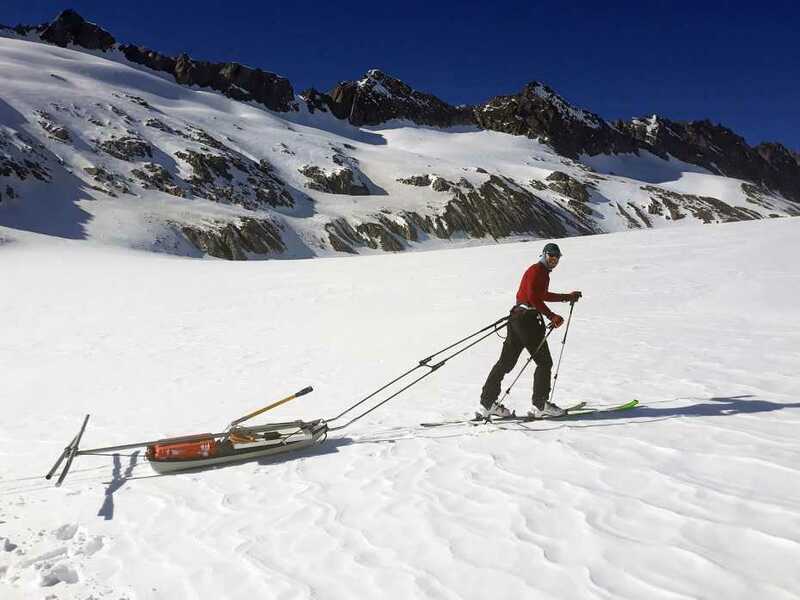 The easiest way to move was on skis: a researcher transports material and tools.